The TARDIS lands in what looks like an ordinary hotel, as the time-travelling drama continues. But the walls move, corridors twist and rooms vanish. There is a room for every visitor that contains their deepest, darkest fears. Fears that will kill them. What lies in the Doctor's room? And when his turn comes, will he welcome death like all the rest? 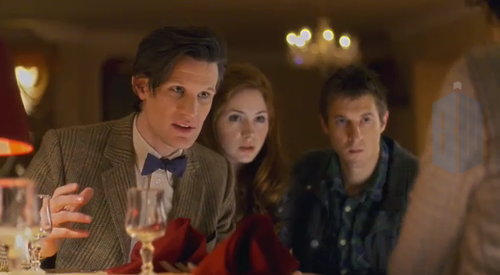 The Doctor is played by Matt Smith, Amy by Karen Gillan, Rory by Arthur Darvill and Gibbis by David Walliams. * Rubix's Cube again, are we being shown parts of a puzzle? * What was behind the Doctor's door? My first thought was Doc 12 due to the Cloister Bell, but it could be the astronaut maybe? * Was there an odd noise again as the TARDIS left Amy and Rory at the end? I also noticed the Rubik's cube, it's interesting. And about the Doctor's door, I don't have any real guesses. But I really like your theory of it being 12. I don't think the Doctor's afraid of dying, so no astronaut or River, and while he hates himself he doesn't fear himself, I think, so it wasn't another 11 there. But I like your theory because 12 isn't really death, but it is a complete change, and it means the loss of 11. It could even tie back to Tennant's run, and his "I don't want to go.". Of course, he knows he won't really die, but he wants to stay like *that* for as long as possible. Which in turn leads to the Doctor accepting that he'll die, and regenerate, and that that's good, so he goes to Lake Silencio (as a Spanish speaker, I feel dumb for not noticing that earlier), and so whenever his real death happens, he'll be happy and accept it, unlike emo!Tennant. (Not that I didn't like how he went off, but a happy death is more fitting of 11). Where was the rubix cube the first time? I saw it in this episode but not before. How could it be 12? He knew who it was, whatever he saw, and he doesn't know what he's gonna look like. He would know his past selves, but not his future ones. Thats why 5 didn't recognize 10 etc. It could have been 11. It could have been the TARDIS from Gaiman's ep, if the Cloister Bell went off, although Im not sure why that would be. It could have been old Amy from The Girl Who Waited, who hated him. It could have been himself in the form of the Dream Lord too. I just don't think it was 12 because he wouldn't have known, imo. Iceman wrote: Where was the rubix cube the first time? I saw it in this episode but not before. He found a Rubik's cube on Night Terrors, and said he hated them because he couldn't solve it. And now he had one, solved. Oh. It was in Night Terrors. Well maybe, but there wasn't a 10 minute scene dedicated to how much he didnt like wine, and then have him drink it and like it in a later episode, like he did the apple. Iceman wrote: Well maybe, but there wasn't a 10 minute scene dedicated to how much he didnt like wine, and then have him drink it and like it in a later episode, like he did the apple.